If you are going to buy just one piece of snowboard kit buy boots first. Though it may be tempting to buy that board with the funky graphic and have it sitting in your bedroom to show off to your friends, boots are the single most important piece of a snowboarders arsenal. Think about it. If your board is a little too long or short, you’ll still be able to ride and have fun. But if you skimped on your boots, or you’re opting for rentals, you may well find that after just a couple of runs your toes hurt, your heels are blistered or your feet are sliding around all over the place. This will put an early end to your day of snowboarding. A well fitting pair of boots are the single most important factor to enjoying the sport of snowboarding. You rarely hear complaints about boards or bindings, goggles or gloves, it’s boots which will make or break your trip. Types of Boot: Hard or Soft? 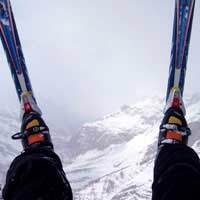 In the early days of snowboarding, hard boots (which closely resemble ski boots) were used, and are still preferred by alpine racers and carvers. These are less comfortable then soft boots, but provide much greater support, and are much more responsive allowing increased precision and control of the board, prefect for high speed racing, or freecarving. However, the vast majority of snowboarders these days opt for soft boots. These are made from soft, flexible material, which allow the comfort of a sports trainer, yet are supportive and stylish too. Unless you are an advanced freestyler who should choose a freestyle boot, it is best to go for an all mountain freeride boot, which will perform well in most mountain conditions and terrain. Fit is the key. There are many manufacturers and model of snowboard boot and each tends to have a slightly different shape. Therefore, the only way of finding the right fit for you is to go to a snowboard shop and try on as many different pairs as you can. Make sure you lace them up tight and have a good wander around the shop floor. Look for a boot which feels snug, but is not too tight and holds your heel down so as to prevent “heel lift”. Boot sizes are the same as regular shoe sizes, but shape can vary. Certain models and manufacturers are known for suiting certain feet shapes, - i.e. narrow or wide. Ask the shop assistant lots of questions before you make a decision. Don’t be hasty – remember your boots are what will make or break you on the slopes. For those with slightly unusually shaped tootsies, “heat moulded” inners are your saviour. These are a removable inner part of the boot, which can be heated up and then put on your foot whilst still warm. You then do a few laps of the shop and the lining moulds to the exact shape of your foot. Before buying, think about what bindings you want. The vast majority of boots are compatible with regular bindings or flow bindings, but if you want a step-in binding (a quick release system) then you will need a special boot. The last thing to think about is the lacing system. Most boots use regular “shoe” laces, which are perfectly fine and have stood the test of time. However, recently a new type of system has appeared called the “boa” system, which is lace-less and uses metal wires and a dial which can be tightened or undone very quickly, and most usefully, whilst you’re still wearing your gloves. Before buying, take your time, try on as many pairs as you can and get that perfect fit. A badly fitting boot will rob you of the joys of snowboarding, and leave you wishing you’d taken up knitting instead.